In this tutorial, we will go over the installation of Logstash 1.4.2 and Kibana 3, and how to configure them to gather and visualize the syslogs of our systems in a centralized location. Logstash is an open source tool for collecting, parsing, and storing logs for future use. Kibana 3 is a web interface that can be used to search and view the logs that Logstash has indexed. Both of these tools are based on Elasticsearch. Elasticsearch, Logstash, and Kibana, when used together is known as an ELK stack. We will install the first three components on a single server, which we will refer to as our Logstash Server. The Logstash Forwarder will be installed on all of the servers that we want to gather logs for, which we will refer to collectively as our Servers. To complete this tutorial, you will require root access to an CentOS 6.5 VPS. Instructions to set that up can be found here (steps 3 and 4): Initial Server Setup with CentOS 6. Let's get started on setting up our Logstash Server! Elasticsearch and Logstash require Java 7, so we will install that now. We will install OpenJDK 7. Note: Logstash 1.4.2 recommends Elasticsearch 1.1.1. Now that Elasticsearch is up and running, let's install Kibana. Note: Logstash 1.4.2 recommends Kibana 3.0.1. This is necessary because we are planning on accessing Kibana on port 80 (i.e. http://logstash\_server\_public\_ip/). Before we can use the Kibana web interface, we have to install Nginx. Let's do that now. Because of the way that Kibana interfaces the user with Elasticsearch (the user needs to be able to access Elasticsearch directly), we need to configure Nginx to proxy the port 80 requests to port 9200 (the port that Elasticsearch listens to by default). Luckily, Kibana provides a sample Nginx configuration that sets most of this up. Then enter a password and verify it. The htpasswd file just created is referenced in the Nginx configuration that you recently configured. 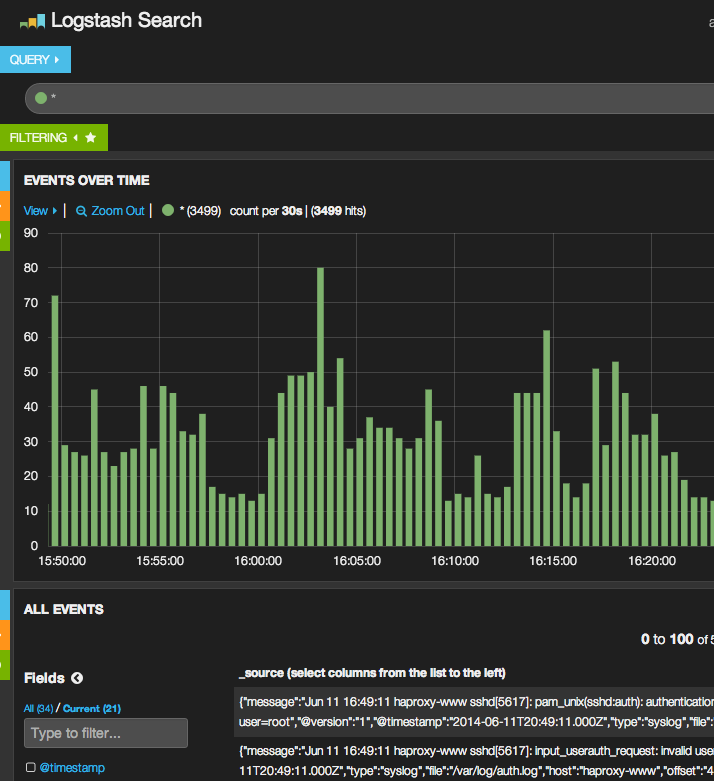 Kibana is now accessible via your FQDN or the public IP address of your Logstash Server i.e. http://logstash\_server\_public\_ip/. If you go there in a web browser, you should see a Kibana welcome page which will allow you to view dashboards but there will be no logs to view because Logstash has not been set up yet. Let's do that now. Since we are going to use Logstash Forwarder to ship logs from our Servers to our Logstash Server, we need to create an SSL certificate and key pair. The certificate is used by the Logstash Forwarder to verify the identity of Logstash Server. The logstash-forwarder.crt file will be copied to all of the servers that will send logs to Logstash but we will do that a little later. Let's complete our Logstash configuration. If you went with this option, skip option 2 and move on to Configure Logstash. If you have a DNS setup with your private networking, you should create an A record that contains the Logstash Server's private IP address—this domain name will be used in the next command, to generate the SSL certificate. Alternatively, you can use a record that points to the server's public IP address. Just be sure that your servers (the ones that you will be gathering logs from) will be able to resolve the domain name to your Logstash Server. The logstash-forwarder.crt file will be copied to all of the servers that will send logs to Logstash but we will do that a little later. Let's complete our Logstash configuration. Save and quit. This filter looks for logs that are labeled as "syslog" type (by a Logstash Forwarder), and it will try to use "grok" to parse incoming syslog logs to make it structured and query-able. If you want to add filters for other applications that use the Logstash Forwarder input, be sure to name the files so they sort between the input and the output configuration (i.e. between 01 and 30). Now that our Logstash Server is ready, let's move onto setting up Logstash Forwarder. Note: Do these steps for each server that you want to send logs to your Logstash Server. For instructions on installing Logstash Forwarder on Debian-based Linux distributions (e.g. Ubuntu, Debian, etc. ), refer to the Set Up Logstash Forwarder section of the Ubuntu variation of this tutorial. Save and quit. This configures Logstash Forwarder to connect to your Logstash Server on port 5000 (the port that we specified an input for earlier), and uses the SSL certificate that we created earlier. The paths section specifies which log files to send (here we specify messages and secure), and the type section specifies that these logs are of type "syslog* (which is the type that our filter is looking for). Now Logstash Forwarder is sending messages and auth.log to your Logstash Server! Repeat this process for all of the other servers that you wish to gather logs for. When you are finished setting up Logstash Forwarder on all of the servers that you want to gather logs for, let's look at Kibana, the web interface that we installed earlier. In a web browser, go to the FQDN or public IP address of your Logstash Server. You should see a Kibana welcome page. Click on Logstash Dashboard to go to the premade dashboard. You should see a histogram with log events, with log messages below (if you don't see any events or messages, one of your four Logstash components is not configured properly). Now that your syslogs are centralized via Logstash, and you are able to visualize them with Kibana, you should be off to a good start with centralizing all of your important logs. Remember that you can send pretty much any type of log to Logstash, but the data becomes even more useful if it is parsed and structured with grok. Note that your Kibana dashboard is accessible to anyone who can access your server, so you will want to secure it with something like htaccess.